The common name of the Grape Hyacinth is a reference to the clusters of small, delicate bell shaped blue to purple flowers which resemble clusters of grapes. Although commonly grown as an ornamental plant, the Grape Hyacinth is also provides an excellent early source of nectar for bees in spring. 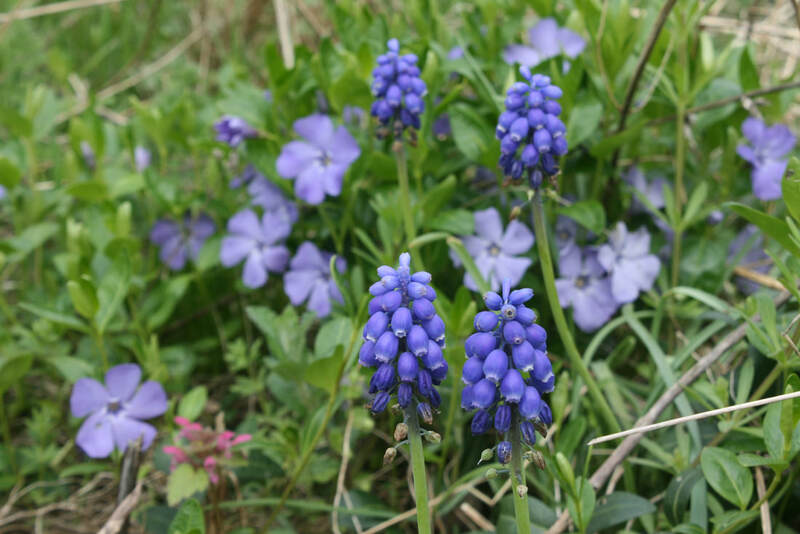 Grape Hyacinth is frequently found in abandoned fields, scrub and in exposed rocky places and prefers a rich open well-drained soil and a sunny position, although it is easily grown in any well-drained soil. It is a perfect candidate for a rock garden or wildflower meadow. To order this plant please contact us balkanecologyproject@gmail.com. native region: Mediterranean region, north to Britain, Belgium, Germany and S. Russia. The bulb is poisonous. It contains a substance called comisic acid, which is said to act like saponin. It is not advisable to eat large quantities of food that contain saponins. Bulb growing to 0.3 m by 0.1 m at a medium rate. It is not frost tender. It is in flower from April - May, and the seeds ripen from July - August. The flowers are hermaphrodite (have both male and female organs) and are pollinated by insects.The plant is self-fertile. It cannot grow in the shade. It prefers moist and well drained soil.